As we dive head-first into 2019, many people have set goals to eat healthy or lose weight and have begun a variety of diets. 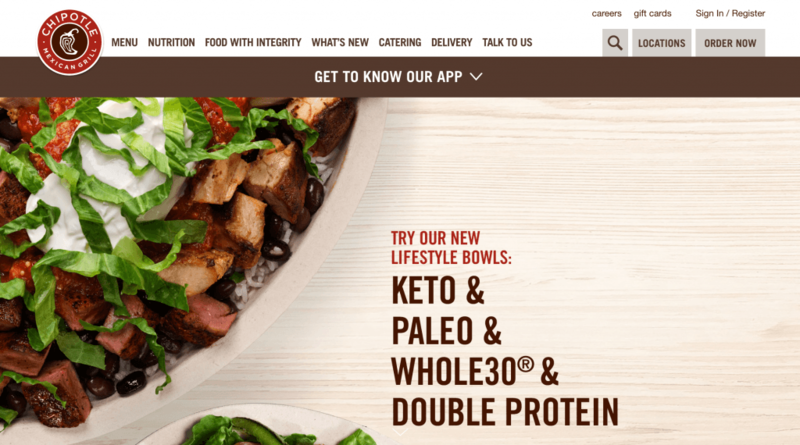 More than ever before, fast food and quick-serve/fast-casual chains have seen the value in offering on-the-go options for their keto customers, Whole30-doers and paleo patrons. With 80% of New Year’s resolutions failing by February1, the Chipotle-style restaurants of the world are here to help. A quick Google search for “best diets of 2019” returns various guides for Whole30, Mediterranean, DASH, paleo, vegan, Nordic, keto, Weight Watchers, Pegan (paleo-vegan), anti-inflammatory…the list goes on. As the general population grows more concerned with their overall health and wellness — and largely having a greater understanding that what works for one person may not for another — they find there’s not a one-size-fits-all answer to adding a “diet” to your menu. As diets become lifestyles, chains that already incorporate customization on their menus have an easier time accommodating specific dietary desires. That being said, this opens a whole new door to mass-acceptance of healthier, nutrient-rich demand when dining out in quick-serve situations. You used to only find this type of dietary accommodation around LA or New York, maybe San Fran or Seattle, but never before has this level of dietary acceptance been made across the nation. As dietary standards rise, restaurants — and therefore manufacturers — have no choice but to adapt alongside their customers. We pose the question: are many of these diets even a fad? They’ve been around for some time now, only growing in popularity. The differences in today’s “fad diets” and those of the 90s are whole foods, higher fat, and focus on origin of food, rather than low-fat shakes and non-fat cheese. Used-to-be “alternative lifestyles” are now mainstream and restaurants are finally recognizing them as such. 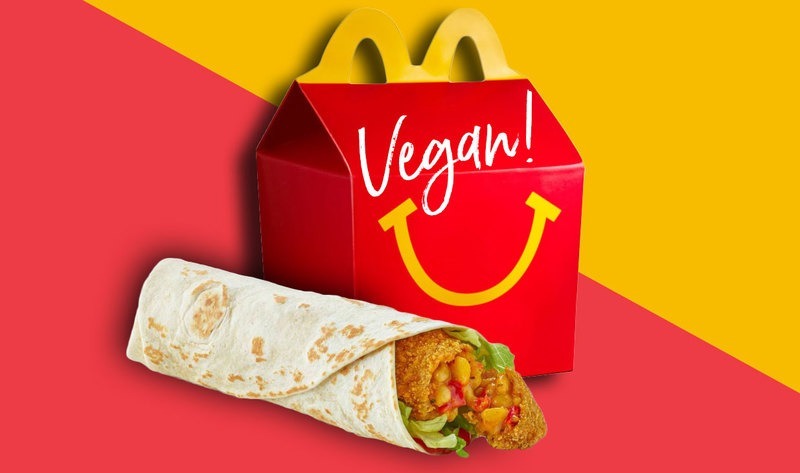 McDonald’s UK now offers vegan and vegetarian Happy Meal options3, and McDonald’s Sweden recently launched their first vegan Happy Meal4 — the McFalafel. Add those to the list of restaurants already offering options like the Impossible Burger or Beyond Meat, and we will see vegan options on more menus in 20195. Keep an eye out for greater transparency in food origin, lower sweetness levels6, and values at the center of purchasing decisions for these large chains. 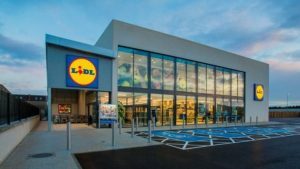 Dining options that have previously limited their stake in these issues are getting pressure from consumers to adapt, and, as a result, these chains will likely turn to manufacturers to help accommodate these requests. “80% of New Year’s resolutions fail by February — here’s how to keep yours.” Business Insider. January 2017. “8 Fast Food Joints With Surprisingly Great Paleo and Whole30 Meals.” Thrillist. January 2019. “McDonald’s UK Launches Its First Vegan Happy Meal.” VegNews. January 2019. “McDonald’s Just Launched Its First Vegan Happy Meal In Sweden.” Delish. January 2019. “The year of the vegan.” The Economist. January 2019. 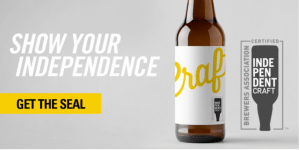 “10 Macro Trends Impacting Food And Beverage Innovation In 2019.” Forbes. January 2019. It’s a snowy afternoon in mid-January and I’m sitting with our integrated planning team talking about the most frequently asked questions from clients. 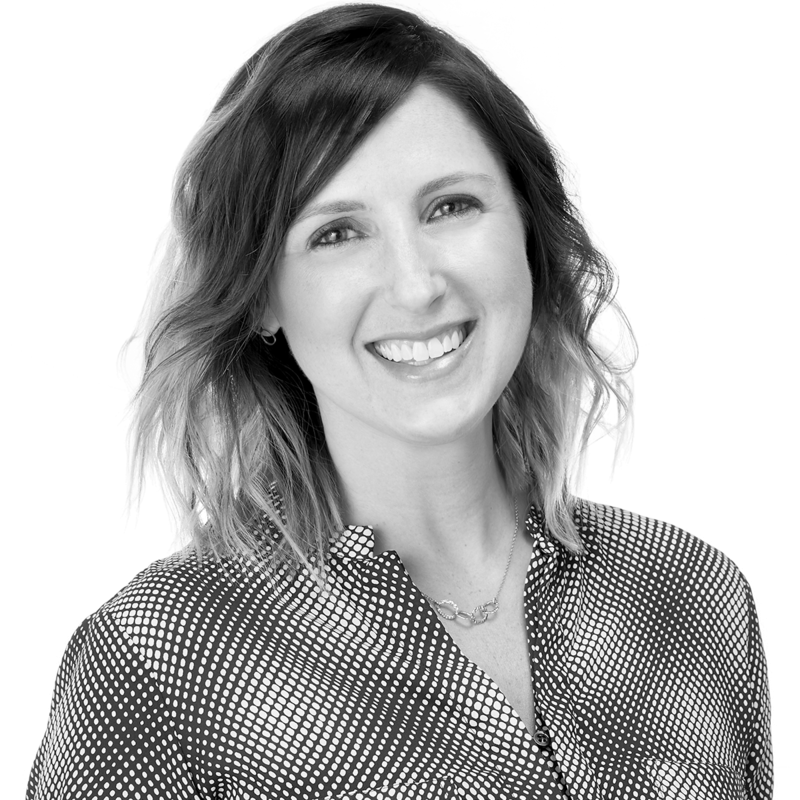 From understanding what to expect in audience engagement, platform usage and content demands, the team agreed social media warranted a deeper dive for our foodservice clients. So last month, we partnered with Datassential for a proprietary research study with over 400 operators across all segments asking about a variety of topics including social media, advertising content and trade shows. For this month’s Thought for Food, we’re giving our readers an in-depth analysis into operators and social media usage, as well as considerations for your 2019 marketing plans. Our decision to invest in operator research began while reviewing Datassential’s 2017 Media Engagement study, which showed the most popular types of media used by foodservice operators to get information for their business. The data didn’t just confirm our team’s intuition on operator social media use, it showed adoption of these tools was deeper than conventional wisdom would indicate. That intel provided us a point of focus. 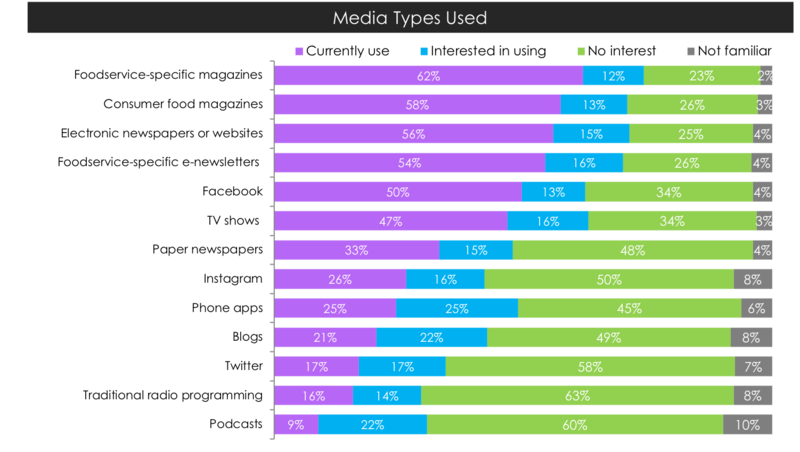 Source:“Pulse Topical Report: Media Engagement Chapter.” Datassential. December 2017. What percentage of operators are actually following foodservice and/or beverage suppliers? Which platforms do they prefer/use most often? In our follow-up Omnibus study with Datassential, we found that 52% of all foodservice operators follow foodservice and/or beverage suppliers on social media, with Facebook, Instagram and Twitter being the most used platforms. Social media must become part of our operator engagement strategies moving forward. As the foodservice decision-maker demographic shifts to include more Millennials–the most active generation on social media overall–manufacturers will need to be active on these platforms to reach this group. Many B2B industries are already involved in social selling–the use of social media by sales professionals to interact with and sell to prospects, by offering content and answering questions until they are ready to buy–and foodservice is not far behind. Certain segments are more active than others on social media and gravitate towards different platforms. Commercial and C&U operators are most likely to be engaged, while Healthcare and K-12 decision makers are least likely to be active. Source: “JT Mega Operator Omnibus.” JT Mega and Datassential. February 2018. What is the most popular platform? Facebook is the most popular–likely due to its longevity in the marketplace. But that doesn’t mean it should be your go-to platform when investing in a social strategy. Your content plan, marketing objectives, target audience and budget will largely dictate which social platform makes the most sense for your brand. What type of content is most valuable? Food and consumer trends, new product updates and company news were frequently sought after by all operators, while white papers, contests and success stories scored low across all audiences. Investing in a social strategy is a long-term commitment. 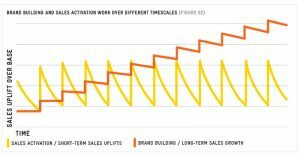 It requires consistency to build brand awareness and brand loyalty over time. Social can be a very powerful tool for your brand, but it needs resource prioritization. Look for more social media insights in our upcoming “Marketing to the Modern Foodservice Operator: Social Media ” e-book scheduled for release later this month. 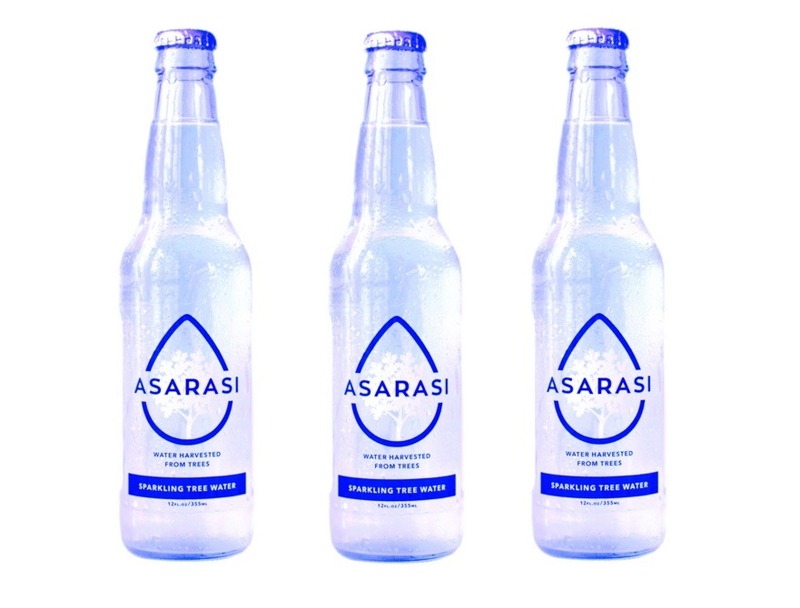 This past July, Vermont businessman Adam Lazar celebrated a remarkable achievement: getting USDA organic certification on his new line of bottled water, Asarasi. Yep, you read that right. Organic water. Because water has no carbon molecules and is therefore technically inorganic, the USDA has previously excluded water as an ingredient making organic claims. But Lazar’s company found a loophole: because the water is naturally filtered through, and extracted from, living maple trees, Asarasi meets the definition of organic. Quite possibly more remarkable than Lazar’s new certification is the level of customer demand. According to its 2016 Bottled Water Category Report, Mintel found a whopping 25% of Americans say their ideal bottled water would be organic. While the customer demand for organic continues to increase, so does the confusion around what organic really means. 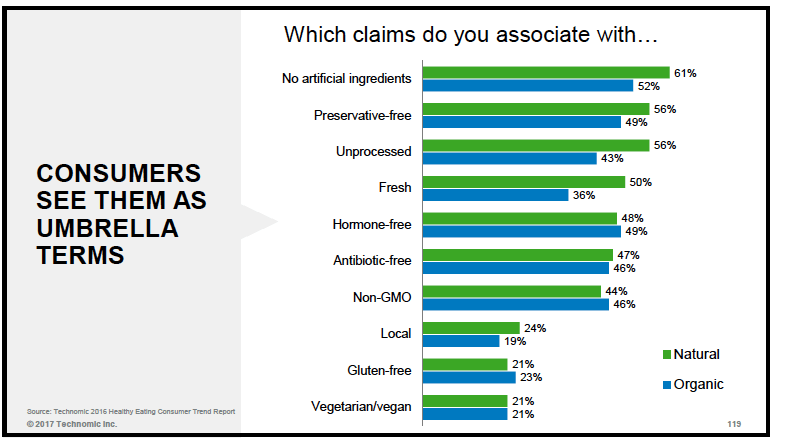 In its 2016 Healthy Eating Consumer Trend Report, Technomic found that when it comes to “natural” vs. “organic,” the majority of consumers understand these labelings as umbrella terms for better-for-you. Brands should go beyond “natural” and “organic” to better communicate the value of better-for-you products to customers. It’s not to say that “organic” and “natural” do not hold value; these umbrella terms are still the most widely recognized and sought-after by customers. Rather, brands have an opportunity to bolster their credibility by providing additional clarity around these terms to ensure customers can make more informed choices. If a brand or product narrowly meets a specific better-for-you classification–or falls within it due to a little-known loophole–proceed with caution. We risk jeopardizing customer trust when we exploit technicalities in the labeling process. Provide context to broad claims by getting specific about your practices and production methods. Rather than just using “antibiotic free” as a claim, provide details on whether it’s a judicious use of antibiotics, no human antibiotics, or no antibiotics ever. Customer confusion occurs when manufacturers use different terms to describe the same thing, such as using “natural” and “all natural” interchangeably. Create tightly defined parameters to determine whether an item meets a specific classification, but also enact strict guidelines on the words used to describe them. “Is Blue Apron a tech startup or a food company?” was the question CNBC writer Todd Haselton set out to answer in his recent article “Every Company Is a Tech Company Now.” Haselton writes that though the company provides perfectly portioned farm-fresh ingredients and modern chef-inspired recipe guides, Blue Apron is also using highly sophisticated algorithms and logistics to do something older companies, like grocery chains, hadn’t considered until recently: delivering meals you can cook yourself. Which is why a deluge of food-tech startups are looking to disrupt how we procure, grow, harvest and serve sustenance, such as Memphis Meats, Gotham Greens and Perfect Day Foods. Big Food must embrace the role of Big Food-Tech to ensure long-term growth and success. There is no question that the overarching food system of today is not the model that will provide sustenance to millions of consumers worldwide ten or twenty years from now. Big Food has the unique advantage of having access to financial capital, human resources, and sophisticated supply and logistic chains to heavily shape what the food system of tomorrow can and should be. The shift from food company to food-tech company requires a shift in business priorities. Acquiring new brand/product portfolios will always be important for sustained growth, but Big Food must also gain access to the required food technology in order to stay competitive. Much of our industry’s current innovation focuses on the end product to the customer. Features and benefits like product shelf life, taste, and incorporation of on-trend ingredients or preparation methods are common areas of focus for R&D. But the same focus must also be placed on innovating front-end production–whether that’s on the farm or at the plant. Innovations that improve/preserve natural resources, provide better quality of care for animals or even improve the conditions of those working within the supply chain will become more important factors in how customers choose food and beverage products moving forward. 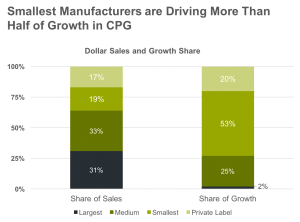 The good news is that many Big Food companies have started to make these investments. Accelerators not only help propel category innovation, but position Big Food as Big Thinkers. Land O’Lakes recently launched its Dairy Accelerator program to invest in dairy startups to drive category innovation and stave off competition from plant-based alternatives. Sanderson Farms isn’t backing down from its antibiotic use in poultry, despite most major players in the poultry industry moving toward “no antibiotics ever”. Faced with mounting customer—and shareholder—criticism, the company released a comprehensive infographic backed by outside professional resources explaining its position. The experts are reputable. The facts are correct. The rationale is sound. Yet I’m willing to bet this newest effort will fall on mostly deaf (and likely defiant) customer ears. 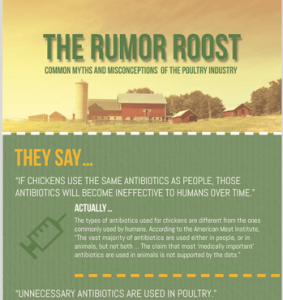 At their 2017 Iconosphere research presentation “Untruth and Consequences,” strategists Lindsey Roeschke and Derek Stubbs argued when customers accuse brands of lying—as many Sanderson Farms customers have done when it comes to the safety of their chicken products—it has little to do with facts. Roeschke and Stubbs point out that today’s customer increasingly believes that a lie is “anything I disagree with.” We are now called liars when our company’s actions suddenly misalign with our customer’s personal values. Roeschke and Stubbs aren’t alone in this assertion; the Oxford Dictionaries declared “post-truth” as the word of the year for 2016. Sanderson Farms’ current situation illustrates that post-truth has moved from politics to plate. Sanderson Farms would be more successful if they reprioritized its communication to values-first, facts-second. The problem isn’t Sanderson Farms’ position, it’s how the company is arguing it. The company’s current approach seems to be “our facts are better than your facts;” an argument that is unwinnable with today’s customer. The disconnect here isn’t about facts. It’s about customers feeling that the safety of themselves—and their families—is at risk and their concerns aren’t being acknowledged. Changing our approach to prioritize values alignment requires us to rethink how we talk to customers about hot-button issues. Identify the real issue. By looking beyond what they say, to what they mean, we can address our customers’ real concerns. Share their concern first. By acknowledging—and sharing—their real concerns upfront, we are putting our customers’ needs ahead of our own. Follow it with the facts and/or company position. Facts are still important. But facts only matter when we trust the source. By placing values first, we help to build customer trust. Finish by reiterating the real issue. By bookending a response with the real issue, we reinforce our common ground. Less complexity. Meaning, fewer choices. At first this sounds counterintuitive to what we know about customers demanding choice and customization at every turn. But choice requires decisions, and that activity is increasingly causing anxiety. In her 2017 Iconosphere address, Kathleen Vohs, Distinguished McKnight University Professor at the University of Minnesota, argued that people today are increasingly choice-fatigued. In fact, she revealed the average person makes 225 food decisions per day. Similarly, Gartner (formerly CEB) found in their 2016 research that 20% of U.S. consumers experience anxiety in everyday decisions, with younger generations reporting even higher levels. Curating customer decision-making must be a pillar of today’s customer-service framework. Rather than simply providing choice, we should strive to curate relevant solutions. That means understanding our customers’ needs, and their customers’ values, on a deeper level. Executed properly, brands have the opportunity to differentiate themselves as a true business consultant. In theory, it’s simple: make it easier for customers to buy your products. SKU rationalization: Eliminate underutilized items or expand offerings based on customer needs. Optimize the decision-making process: Make it efficient to find – or proactively provide – only the most relevant product/brand information for your customers. Understand strategic sacrifice: All choices require sacrifice. Understand the ‘must have’ and ‘nice to have’ criteria of your target customer to make more meaningful recommendations. Because sometimes, less really is more.